Shadow Visions for the purpose discussed in the description. Mulligan the secret if you desire to live infinitely (or at the very least until your opponent dies). The deck works well enough on its own that you can afford to mulligan the secret. 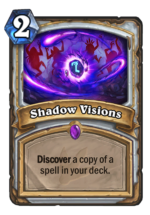 If you are able to, using the card that makes this all work, Shadow Visions, will allow you to discover a copy of the secret hidden in your deck (which you will later be able to play and fulfill once again). Even if you don’t discover the Quest, you’ll be able to choose from a variety of high value cards that can help whatever situation may arise. The Spirit of the Dead works as an amazing addition as it adds the capability of refilling your deck, much better than Archbishop Benedictus would, in that it puts in high value deathrattle cards to complete the quest in the aforementioned way. Even if you decide not to try for the infinite secret path, playing this card at the right time fills your deck with extremely strong cards at the cost of 1 mana. It’s all about the timing in playing it.